Some people have described a wood router as the most versatile and useful piece of woodworking equipment you could ever have in a workshop. Whether you are a professional cabinet maker, a keen do-it-yourself enthusiast, or a woodworking hobbyist, a good wood router will help you turn out professionally finished pieces of work, time after time. When you have one of the best wood routers in your woodworking armory, you will be able to cut slots and grooves in wood, create mouldings, carve your own signs, make no end of different wood joints, create inlays, and create elaborate decorative edges. In fact, the list of woodworking jobs that you can do with a good wood router goes on and on. Our wood router buying guide explains some of the terminologies you will come across, what some of the features of wood routers can do for you, and what to look out for wood routers. The DEWALT DWP611PK Router Combo Kit is a great combination of power and ease of use. It’s a combined fixed wood router and plunge router, so it will handle a huge variety of woodworking jobs with ease. Its ergonomic design makes it comfortable to use and easy to control, and the LED lights provide optimum visibility when you are working. The DWP611 compact router has a powerful 1-1/4 horsepower motor with variable speed, which makes it one of the most powerful wood routers in its class. This best in class wood router also has soft start, which gives greater control over that powerful motor, and the full-time electronic feedback keeps the motor speed constant throughout a cut. When you use the DEWALT DWP611PK with the plunge base, you get excellent control and the depth scale and the marker are very clear and precise. Power, control, precision, and amazing value for money are what you get with the DEWALT DWP611PK, so that’s why it’s on our list of best wood routers in 2016. Check our detailed Dewalt DWP611PK review! The Porter-Cable 7538 Speedmatic is tough and powerful plunge wood router built to professional standards. It has a powerful 15-amp motor, with soft start, that delivers more than enough punch to handle any type of wood or cut. Setting the depth of a cut is made easy by the rotating turret and, when you hit the depth stop, it feels nice and solid like the best wood routers should do. The plunge mechanism on this model is very smooth to use, making cutting things like mortise cuts easy to do. It’s easy to switch depths too, so cutting things like tongue and grooves is made a lot simpler as well. When you want to change the bit, there is a neat collet auto release system that makes that job a fast and simple one. This is a heavyweight, commercial quality wood router that will never let you down and nearly all reviewers are happy to sing its praises and give five stars out of five. We are happy to add our own recommendation to the many others for this best plunge router. Check out our review of the Porter Cable 7538. This great variable speed plunge and fixed base wood router kit from Bosch will easily handle most routing jobs and it has a plethora of advanced features to get those jobs done quickly and efficiently. The Bosch 1617EVSPK is a variable speed wood router that delivers a whopping 2-1/4-horsepower with variable speed of between 8,000 to 25,000 RPM. It also features smart response circuitry, which keeps the speed constant as you cut, so you get clean and accurate results every time. You can tell from the moment you pick up the Bosch 1617EVSPK that it has been built to last. It has a sturdy aluminium base and motor housing with tough wooden handles on the fixed base and ergonomically designed soft grip handles on the plunge base. It’s rugged, it’s tough, but it’s also precise. The Bosch 1617EVSPK best wood router has a soft start motor, electronic variable speed, micro-fine depth adjustments, and both 1/4-Inch and 1/2-Inch Collets too. This best wood router is powerful, versatile and easy to use. The boys at Bosch have excelled themselves with this one. Check our Bosch 1617EVSPK detailed review. 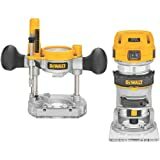 This next choice on our list of best wood routers is another combined plunge base and fixed base router kit from DEWALT. The DEWALT DW618B3 actually comes three interchangeable bases. It has the plunge base and the fixed base, but it also has the addition of D-handle base, which will come in really handy for when you need a little bit of extra control and precision. The model features 2-1/4 horsepower variable speed motor which delivers the power you need to cut through even tough hardwoods with ease. Bit changes are easy, and you only need one wrench to do it. There are Quick-release motor latches, which make removing the motor pack fast and simple. We also liked the self-releasing, eight slotted collets, which help to stop the bits jamming. The rubber coated handles are comfortable to use and the machine has a low centre of gravity, so it’s well-balanced and easy to control. The DEWALT DW618B3 also has a patented dust collection system that it really efficient and it is positioned in such a way that you can attach a shop vacuum to it without it getting in the way of your line of sight. Check our Dewalt DW618B3 Review here! Our final choice for the best wood router on the market in 2016 is the Bosch MRC23EVSK combined plunge and fixed base Router Pack, which has all the features that a good wood router should have. This one is a 2.3 Horsepower, variable speed wood router with both a plunge base and a fixed base. One of the outstanding features of the MRC23EVSK is the trigger control, which located in the handle and gives you greater control while you are cutting. It’s easy to get the right cut depths too, with the micro fine bit-depth adjustment feature and the adjustable turret. The plunge action is very smooth, and it’s another wood router with constant response circuitry to keep the bit speed constant as you cut. The Bosch MRC23EVSK also has bright, always on, LED lights to help you see where you are making those precision cuts. With the Bosch MRC23EVSK you get superb control, whichever of the two bases you are using, stable and smooth operation, micro fine Precision, and the power of a 15 amp motor. Is the Bosch MRC23EVSK the best wood router on the market today? Well, it definitely deserves its place in our top five! Check our Bosch MRC23EVSK Review here! The technology and features that you find on modern wood routers have come on in leaps and bounds in recent years and that makes finding the best wood router for you even harder, especially if you are a bit of a novice. To help you choose your best router, we have selected five of the best wood routers on the market today in our wood router reviews and below you find some of the main things that you should look for when you are selecting which wood router will be the best one for you. Opinions differ on which is the best wood router a plunge base or a fixed base. A fixed base is easier to set up and to use, but a plunge base is more versatile. 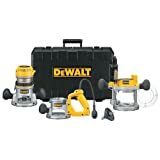 Unless you want to buy two wood routers, the simplest option for the beginner is to go with one of combo kits that have both bases, like the examples we have in our wood router reviews. The horsepower rating of a wood router will give you a guide to the power of the machine, but it is always a trade-off between power and weight. For a general purpose, mid-range wood router, anything around or over 1¼ HP, or 9 amps will generally suffice. Wood routers are powerful machines, so they will never really be what you call quiet. However, some of them do sound like a Boeing 747 warming up, so it is a good idea to check wood router reviews for comments about the noise levels. Being able to make simple cut depth adjustments is a must-have for the best wood routers. Look for models that have micro adjustments in increments of 1/64 of an inch and then you will find that you have to make fewer test cuts. Variable speed is an essential feature if you plan on using large bits. For most jobs, you will simply want the bit spinning fast, but some big bits have maximum speeds that you can use them with for safety reasons. Soft start simply means that when you press the trigger, the speed of the rotation gradually increases. It gives you better control over the router and it will help stop gouging. LED lights are not essential, but they are certainly a nice to have. They provide direct light onto the bit, which simply means that you will be able to see clearly what you are cutting, whatever that light levels are like in your workshop. If you go for a plunge action wood router or a combo router, look for ones in wood router reviews that state that the plunge action is smooth. This is an indication that the travel of the plunge mechanism is easy to control. Finally, although there is no real definition of what “ergonomically designed” really means, it does mean that the manufacturer has at least put some thought into the user comfort when they were designing the wood router. Look for wood router reviews that mention the comfort and the placement of the handles. It’s not essential, but it could help stop you getting aching wrists, especially when you use the router for any length of time. We hope that you have found our wood router buying guide and wood router reviews useful. With the best wood routers, you can get amazing results fast and do all kinds of woodworking jobs that would take an age to do manually. When you get your first wood router, we do recommend that you practice first on some scrap wood, you pay attention to your safety, and you wear the appropriate safety gear, such as safety glasses. Wood routers are not difficult to use and, with practice, you will soon find you can achieve some stunning results. We also suggest that you read up on all the many different jobs that you can do with a wood router. You can create ornate edges,make seamless joints, cut out inlays, recess hinges, and carve patterns and words too.